The Chinese Heritage Institute and Dao Hua Qigong School has been established to develop and promote the practice of Hua Gong and related practices as a way of health, artistic expression and spiritual evolution. Hua Gong is related to the Dao, by becoming aware of the Qi one may achieve balance in life. The Dao Hua Qigong School organises the teaching of Qigong in the form of Hua Gong, Feng Shui and related health and spiritual practices. Chinese Heritage co-ordinates events for the Dao Hua Qigong School. From an administrative office in London, classes and courses are organised in many centres in Britain, France, Italy, Spain, Norway and the USA. 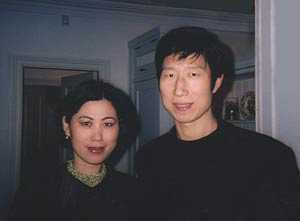 Zhixing Wang and Zhendi Wu are the founders of the Dao Hua Qigong School. Originally initiated and trained by Qigong Masters Zhang Hong Bao and Shi Song, Zhixing and Zhendi have been healing and teaching in the west since 1988. They have developed and are continually evolving the Hua Gong style of Qigong, emphasising the healing, artistic and spiritual aspects of Qigong. Zhixing holds a BA in Chinese language and literature from Beijing University and a Master’s degree in communications studies from the People’s University of China. he has published many works in the field of communication studies and numerous articles on Qigong in European journals. Zhixing is known for the clarity and wisdom of his teaching. He has developed his abilities to a very high level and is widely respected in the Qi Gong world. He is especially known for his perceptual abilities which enable him to perceive Qi directly both in people and in the environment. Zhendi holds a BSc in material engineering from Chongqing University and an MA in medical anthropology from London University. She has published a book ‘Qigong Methods for Beauty’ (1988) which was a best seller in China and sold-out very quickly in London. She founded and edits the magazine ‘Worldwide Chinese’ which looks at a wide variety of topics relevant to Chinese people throughout the world. Senior students who wish to teach Hua Gong are given specific and regular instruction by Zhixing. Please contact the administrative office for details of approved instructors in your area.